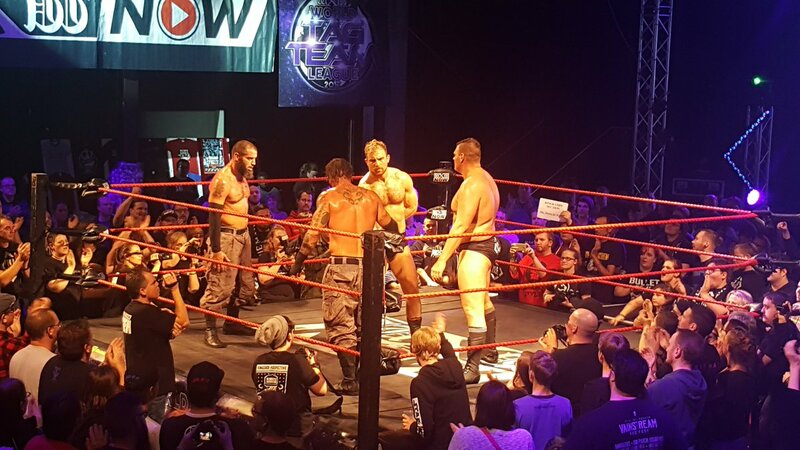 On 6th October 2017, wXw kicked off the three night World Tag Team League tournament at the Turbinhalle in Oberhausen, North-Rhine Westphalia. The tournament took the form of two four team round robin groups, with the winners of each group qualifying for the final. The first round of group match included Ringkampf (WALTER & Timothy Thatcher) taking on The Briscoes (Jay Briscoe & Mark Briscoe) in Group B and A4 (Absolute Andy & Marius Al-Ani) battling Massive Product (Jurn Simmons & David Starr) in Group A, as well as matches featuring the likes of The Rottweilers (Homicide & Low Ki), The Spirit Squad (Kenny & Mikey), Da Mack, Tag Team Champions The Young Lions (Lucky Kid & Tarkan Aslan) and Shotgun Champion Ivan Kiev. But was it any good live? Let's take a look! All pictures are courtesy of wXw. No idea what was going here, as it was presented all in German and I don't speak German, but what do you expect when you're in Germany. It looked like it was basically a WWE Kick Off show type deal, but also with this weird thing where fans got in the ring for a duel of who could touch a turnbuckle first. There was also a match. 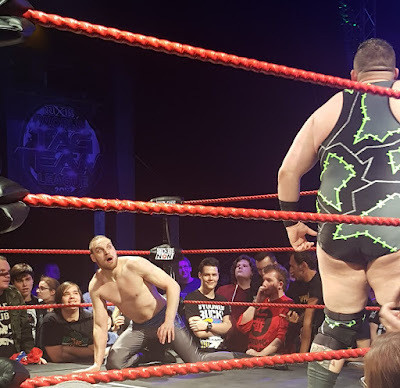 A fun dark match, that gave Jaxon Stone his first singles victory in wXw. It was fairly simple stuff, with a clear heel and babyface dynamic and straightforward storytelling like Stone escaping a DDT, only for Skillet to nail the move a few moments later. Highlights included a tasty looking Michinoku driver from the Jay-FK member and a slick finishing sequence with that saw Skillet escape a Stones Clash (I want to describe the move as a package Styles Clash, because I'm not competent enough to describe it any other way) into a jacknife cover, with Stone escaping at two, straight into a backslide and then nailing the Stones Clash for the win. As would become the theme for the weekend, in it's spot on the live show, it was exactly what it needed to be. Umm...yeah... The Spirit Squad. 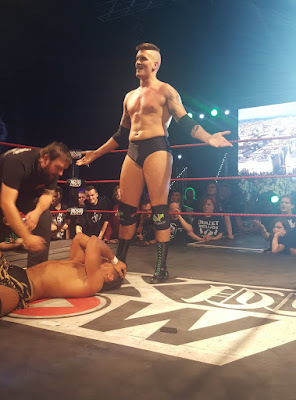 Kenny [Kenny Dykstra] and Mikey [Mike Mondo]'s first appearance in wXw was not a good match and would probably be the worst match in the whole tournament, for a number of reasons. To be fair, there were points in the match where the Spirit Squad did manage to at least galvanise a small amount of fan support from the Turbinhalle, their schtick, like Mikey doing the YMCA, was often cringe worthy and their rudimentary offence made it hard to get behind them as a babyface team, especially when the team began the match by arguing with a small group of fans chanting "Who are you?". Mikey's hot tag was probably the best action of the match, but it didn't last long with the Young Lions able to block double mounted punches, sending Kenny to the outside and picking up the victory with a double stomp and backbreaker combination. This ended up being a real nothing match for me, cutting short before it ever got out of second gear. I wasn't familiar with the feud between the pair heading in, but the pre-match video, as well as how the two fought made it clear that there was a personal issue between the pair. This gave the contest some real energy in the opening exchanges with Da Mack hitting a big jumping knee strike that drove the early part of the contest forward. 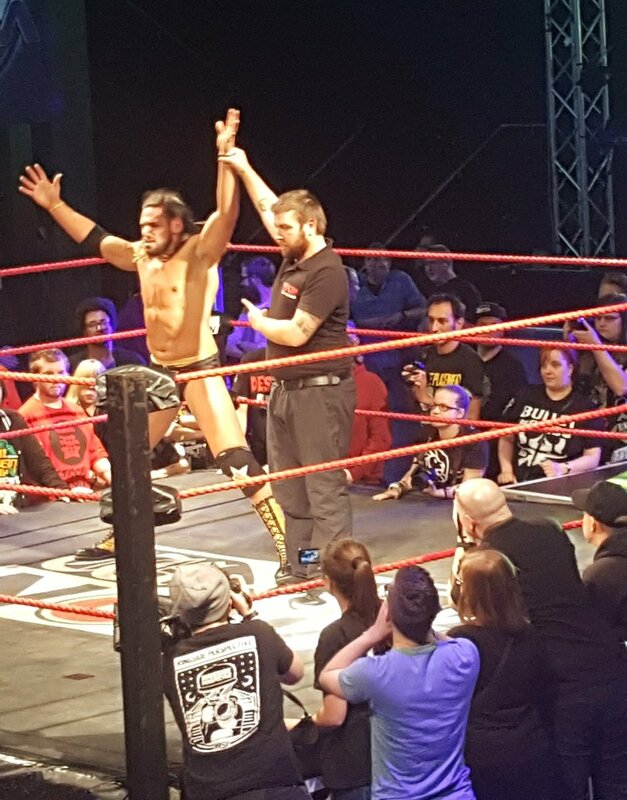 From about three minutes in though, with Julian Nero in control, I felt like it lost a little bit of that intensity that had initially grabbed me and I found myself drifting away from the action in the ring. Perhaps, this was down to my lack of investment in the story, but there just seemed to be something missing, which wasn't helped by the finish seemingly coming out of nowhere. Mack missed a somersault senton, Nero hit a forward fireman's carry slam, before a mid-rope knee drop resulted in the three count. It appeared like Mack had kicked out way before three, but the result stood leaving a very flat ending that seemed to confuse most fans and left me wondering what the hell had gone on. I don't know if it's a thing but A4 did a video dressed as Batman and Robin, which was glorious, but also confusing, but also magnificent. It was a lot of things, ok? This belting tag match pretty much saved the first half, as A4 and Massive Product put on a real show, packed with all the good stuff that makes me a fan of professional wrestling. Two babyface teams can sometimes end up falling flat with an audience unable to decide who to get behind, but Oberhausen had no such problem here with both teams getting strong reactions throughout, producing the best atmosphere of the night so far. The earlier part of the contest saw number of good exchanges as the two teams settled the crowd in and built for the rest of the bout. 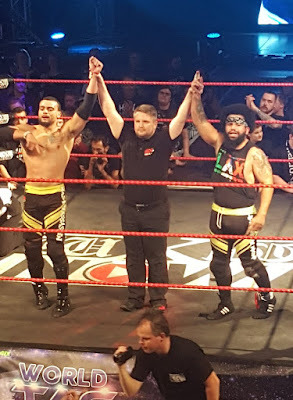 The similar dynamics of the teams presented a good variety of in-ring options with the explosive power of Jurn Simmons and Absolute Andy's opening shoulder block exchange, contrasting with the super smooth exchange that followed between David Starr and Marius Al-Ani. The contest had substance and impact all the way through, flowing well from one section to the next with the foursome rarely missing a beat in what acted as a great introduction to both sides. The turning point of the bout saw Starr take an Fireman's carry facebuster on the outside from Andy, resulting in The Product's knee smashing off the ring post. Starr sold the injury for all it was worth, basically fighting on one leg for the rest of the match and making sure that the injury was never far from the audience's mind. I am essentially in love with David Starr at this point. The injury played nicely into a wonderfully tense submission sequence that saw Starr end up trapped in an Andy sharpshooter after a lovely piece of action lead into a fiery hot tag. The closing moments seemed to leave the knee injury thread hanging a little as the pace quickened and all four men got involved in a thrilling final five minutes, with big moves coming thick and fast. The momentum swung back and forth with A4 hitting an aided leapfrog body guillotine on Simmons, before Al-Ani hit a massive dive over the ringpost, but it was a slick and impactful sequence that saw Massive Product take the three points, with Andy taking a DDT onto the apron from Starr, before Al-Ani succumbed to a spike piledriver, with Starr making doubly sure of the victory with a suicide dive to keep Andy from breaking up the fall. I would've liked to have seen Starr's leg injury play a little more involvement in the final stretch, but the King of Taunts post-match selling was sublime and pretty much made up for that. A pretty typical heavyweight vs. junior type contest, that featured some nice action, without capturing the imagination. With Avalanche having not quite turned babyface and it being the first match back from the interval, the bout seemed to have trouble grabbing the audience, especially early on. The middle portion ended up coming across as a little sloppy with an awful looking hurricanrana from Kiev, where he seemed to completely miss the move only for Avalanche to sell it anyway standing out in particular. The dynamic perhaps didn't produce the best display of either talent, but there was still some good wrestling here, particularly towards the end of the bout. Once Kiev's fellow RISE member Pete Bouncer arrived at ringside, the shift in the matches composition created a number of stellar near falls for both men, including a cute roll-up from Kiev after Bouncer saved him from a cannonball and Avalanche coming close after a frenetic section that saw him fight off both men and nail a double cannonball. Avalanche would win via DQ shortly after, when Bouncer broke up a pinfall from a blue thunder bomb. Whilst the match didn't exactly set the world alight, the post-match segment was absolute fire, after Avalanche had managed hold his own against Kiev, Bouncer and the Young Lions, Unified World Wrestling Champion John Klinger [Bad Bones] joined the rest of RISE in beating down the former World Tag Team Champion. 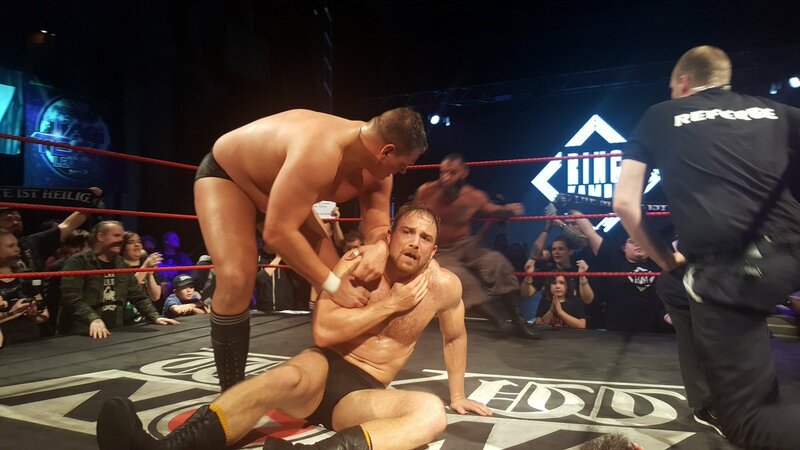 After Julian Nero had failed to help his former Cerberus stablemate, Ilja Dragunov ran in to a massive reaction, eventually cleaning house after a great sequence of action with Klinger, setting the stage for the Unified World Wrestling Championship match the following night, with further seeds planted for a Cerberus reunion. What a main event. 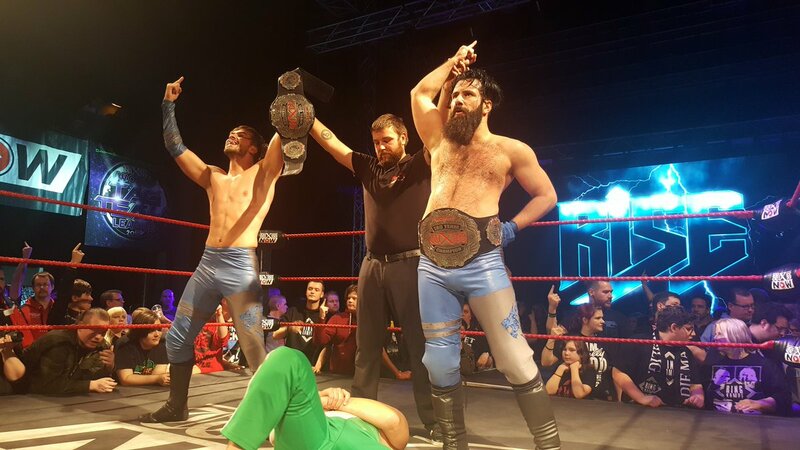 Two of the best tag teams in the world right now going back and forth like mad, throwing the kitchen sink at each other and just generally being a bit bloody brilliant at what they do for over twenty minutes, what's not to like? One of the things that stood was that the Briscoes signature offence was mostly kept to a minimum, especially in the early goings with a general feeling that the contest would be going long and that the brother weren't comfortable in resting on a recognisable move-set or in using spots that have become cliche for the team. 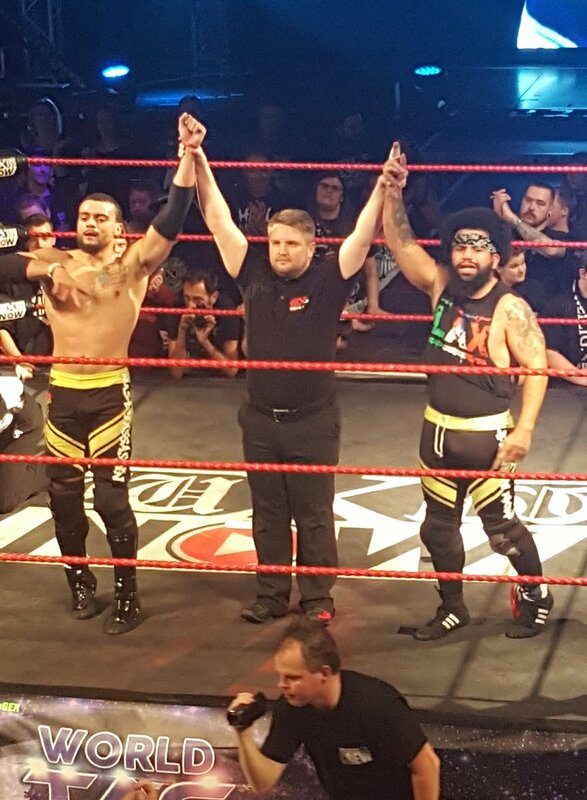 In fact, the match was low in highspots in general, but made the most of them when they came along, using stellar tag team psychology, pacing and a palpable intensity to hold the crowd with the four seemingly knowing exactly the right points to hold back and when to turn up the fire. Don't worry though, the bout still had plenty of "moments" like Jay's mental suicide dive, followed up by a Asai moonsault from Mark, so if that's more your bag this bout is still worth checking out. The takeaway from the match for me was the epic strike battles involving all four men, but particularly between Mark Briscoe and WALTER. Their intense chop battle in the second third of the fight, built well to a massive slap from Mark that got a big reaction before a double spinning back elbow cut off any potential return from WALTER. The interplay between all four was slick as slick can be, moving from hot tag sequences to a nice nearfall off Redneck Boogie (Crucifix Powerbomb/Neckbreaker combination) and then the final stages of the bout with Mark saving Jay from a Thatcher armbar with a Froggbow, only for Ringkampf to lock in a pair of rear naked chokes and see the match out. This bout was maybe a notch or two above the Massive Product vs. A4 for match, this was the match of the night and there is a real argument to be made that is one of the best two v two efforts from The Briscoe Brothers in the last five years. An interesting opening night for the World Tag League, being far from a home run, but setting the stage for the next two nights fairly well. 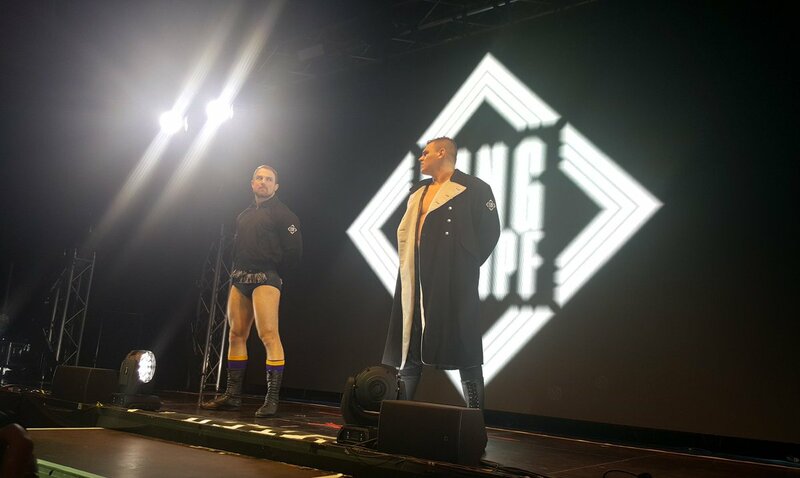 The finest action could be seen within the tournament itself with Ringkampf vs. The Briscoe Brothers and A4 vs. Massive Product both providing great quality action which are worth sourcing on wXwNow on their own, whilst only the Spirit Squad vs. The Young Lions match came out below par. Outside of the tournament, the action wasn't as strong, with both matches being used to further other storylines. I think the thing I took away most from the show was how well the card was laid out and whilst every bout didn't perhaps perform as well as it could, it was clear to see why the bout was chosen to go on at a given point, with a stellar structure and feeling of organisition throughout the whole show.